On the south coast of west Java this little visited site has many of the lowland Javan specialities for those who like to explore. Pelabuhan Ratu is a busy fishing port on the south coast of West Java. It is also a popular weekend holiday destination for the inhabitants of Bogor and Jakarta, and a world famous surfing location. It is not a great birding location, but there are several patches of forest around that are worth exploring if you find yourself in the area. One spot to try is a large block of degraded forest on the hills above Pelabuhan Ratu town. This can be accessed by taking the small road north from town (see map). As the road climbs away from town it swings round to the left and there is an entrance way to derelict looking housing complex. Park in the complex and head off on foot towards the forested slopes. 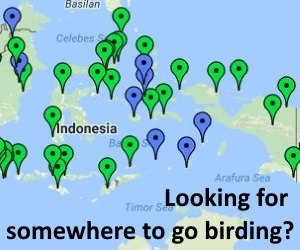 Here there is a chance of the large lowlands barbets, and White-breasted Babbler, Orange-headed Ground-Thrush and Banded Pitta all occur. There are no really obvious paths, so this is a bit of a cross-country expedition! Another very easily accessed patch of forest is along the coast road west of Pelabuhan Ratu, at a site known as Cagar Alam Sukawayara (Sukawayara Nature Reserve). This lies directly behind the big ugly white hotel about 5 km out of town. Many paths cross this small reserve, which among other things holds Javan Barred Owlet and Banded Pitta. About an hour’s drive further to the west is another small patch of forest at Sarwana. This is accessed by turning left of the main road immediately where it rejoins the coast after a big loop inland (see map). This is also the access road to a famous surfing spot. The road itself passes through an area of degraded forest, which can be explored further on foot. 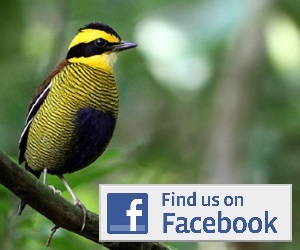 This area holds lots of Banded Pitta and is likely to support several other of the Javan lowlands specialities. Access is easy with a car, but also pretty easy by public transport. Get a bus from Bogor direct to Pelabuhan Ratu town, then use local transport to reach the spots listed above (Angkot, Ojek etc). There are plenty of accommodation and food options to suit all budgets along the coast road west of Pelabuhan Ratu, stretching for around 20km.